Peggie Crombie was born in Melbourne and studied art at school under Norah Gurdon; she later studied at Stott's Commercial Art Training Institute 1921, the National Gallery School, Melbourne 1922-28 under Bernard Hall and William McInnes and took classes with George Bell in the 1940s. She exhibited with the Victorian Artists' Society from 1927-59. In 1930 she exhibited with a group called 'The Embryos'; it included Constance Stokes, Herbert McClintock, William Constable and Eric Thake. She exhibited with Anne Montgomery, Sybil Craig and Jessie Mackintosh at the New Melbourne Art Club in the 1930s and held a joint exhibition of paintings and linocuts with Helen Ogilvie and Helen Boyd at Collins House, Melbourne in October 1932. 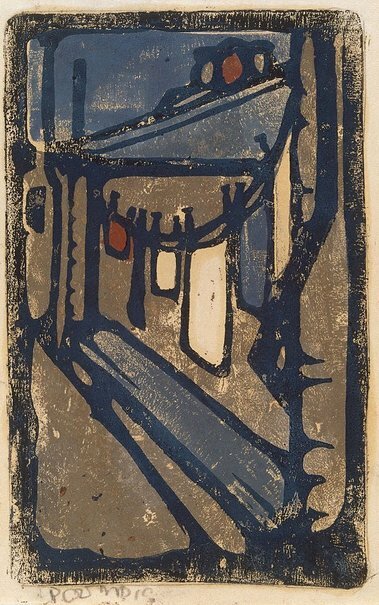 Her linocuts were produced mainly in the early 1930s. She exhibited with the Melbourne Society of Women Painters and Sculptors 1948-76 and was a member until 1983. Signed l.l., pencil "P CROMBIE". Not dated.